Energic motoculteur identification plates/plaques where made from 2 metals namely aluminium and brass, quite thin and of uniform size (6.cms wide x by 6.7cm heigh) throughout the production run of machines. Aluminium plaques where used on the very early Energic motoculteur C7 and D9 models (1931+) and this change for a brief period to a brass plaque with the 411 series both Energic Motoculteurs C7 and D9 (with later S Bloc Motobecane engines). Then reverted back to aluminium for the Energic motoculteur series 413 – and later models. I am sure that in between this period the odd machine sneaked through with a different metal plate/plaque. 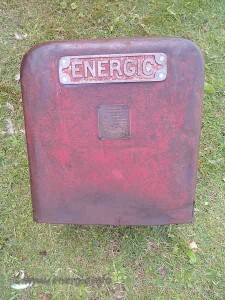 They are situated on the front of the bonnet below the aluminium Energic motoculteur plaque (red background), attached by 4 rivets or squashed metal pins. As you can see from the above photo. Energic motoculteurs Identification plates/Plaques situated front of moteur/capot.
. The Energic motoculteur G9 plaques where situated on the left hand side of the bonnet 4/5 th’s the way up to the top edge. Type; B, B5, C7, D9. – Séries (model 408 etc). – N° de Séries (production n° say 710). 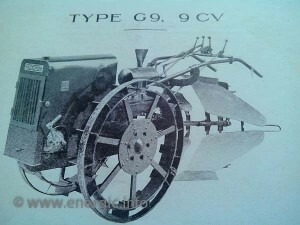 and – Moteur (Type of engine M5, M7, M9, S7, S9 etc). Also a recommendation of the type and grade of oil to be used in the Energic Motoculteur. Namely Kervoline BB for the engine and Kervoline Z for the Gears/transfer box (Pont). 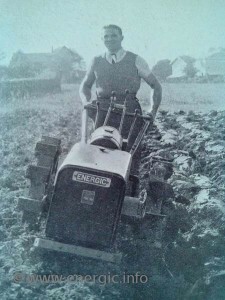 The original 1930’s plows, hoes, ancillary equipment also carried identification plaques. These often where destroyed in use, being at the working end of the motoculteur. Here is a plalue from a plow. 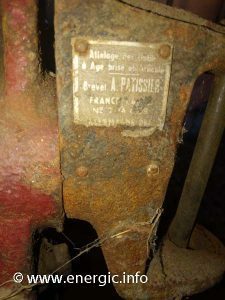 Energic motoculteurs Identification plates/Plaques – plow.